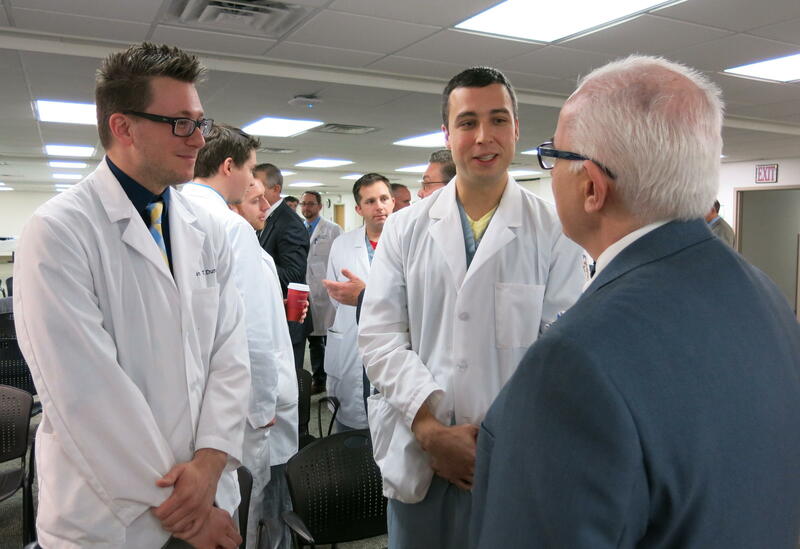 Students from Lake Erie College of Osteopathic Medicine talk with LECOM President John Ferretti. Students will be able to do clinical rotations at Forbes Hospital in Monroeville thanks to partnership between LECOM and Allegheny Health Network. Allegheny Health Network has announced a new academic affiliation, allowing medical students to train at Forbes Hospital in Monroeville. Students from the Lake Erie College of Osteopathic Medicine (LECOM) will be able to do their clinical rotations at the hospital. AHN officials said this move is critical to the future of health care in the region. “We have a whole generation of doctors that are now getting closer to retirement age and so they entire state, and particularly Western Pennsylvania, has a significant need for new students, new doctors to come on board,” said David Holmberg, president and CEO of Highmark Health. Starting in June 2015, Forbes will host 26 third-year students from LECOM for their clinical rotations, and then in June 2016 the number of students will double as the first group completes their fourth year and a new batch of third years arrives. The goal, aside from giving the students hands-on training in a hospital, is to help grow the number of primary care physicians in the region, which could face a doctor shortage in coming years. “A sad statistic is that most medical students who graduate and who end up leaving their schools to go to training programs either leave the state or leave our region in western Pennsylvania,” said Tony Farah, chief medical officer, Allegheny Health Network. But keeping students at training programs near their school may help. LECOM is based in Erie and is the nation’s largest medical college; it ranks among the top five medical schools in the U.S. graduating physicians who enter the primary care field. AHN’s Farah said LECOM draws students from Pennsylvania and from around the country, and added being able to train at Forbes will give them wide-ranging experience. Classroom spaces and a new student lounge are being constructed at Forbes for the program. LECOM graduate Steven Wolfe has been named campus dean of the Forbes Hospital Clinical Site.